I was looking through some old posts tonight that I did back in 2014, and I came across this in the comments section. "14. The de facto fixed exchange rate has served Iraq well. The authorities agreed that a stable nominal exchange rate provides a valuable anchor for inflation expectations in an uncertain environment, and intend to continue implementing this policy for the foreseeable future. In the medium term, staff encouraged the authorities to consider creating the conditions which would make possible a move to a more flexible exchange rate policy. Such flexibility could allow a predictable and gradual appreciation of the nominal exchange rate, triggered by strong oil revenues and the Balassa-Samuelson effect, to accommodate a possible real exchange rate appreciation while keeping domestic inflation low." This report was issued in July of 2013, and I think it's where Kaperoni got his "it's a float" theory. Notice that they didn't say anything about floating the dinar. They just said that in the medium term Iraq should consider a more flexible exchange rate policy - not a different exchange rate regime (as in going to a free float) but a more flexible version of the current exchange rate regime. As I have pointed out more than once, an appreciation of the nominal exchange rate (back then it was 1166:1) could mean that the denominator would increase. In 2015 that's exactly what happened when the dinar went from 1166:1 to 1184:1. Then in 2018 it increased again to 1190:1 which is the current exchange rate. With each increase in the exchange rate the value dropped. “The exchange rate—supported by ample international reserves of the central bank—provides a key nominal anchor to the economy and has served Iraq well. We encouraged the Central Bank of Iraq to renew its efforts to liberalize gradually the foreign exchange market, further reducing the spread between the auction and parallel market rates." The market rate around that time was well over 1200:1. So for them to reduce the spread between the market rate and the auction rate (1166:1 at the time) they would have needed to move the denominator up, which again is what they did in 2015 when they moved it to 1184:1. This move would have reduced the spread as the IMF had recommended. This is why I don't buy Kap's interpretation of the IMF articles. The CBI's response to what the IMF has said is the opposite of what Kap says will happen. They're LOWERING the value, not increasing it. They're bringing the auction rate (or official rate) closer to the market rate. That's why I've been saying for the last couple of years that they'll devalue down to 1200:1. I could be wrong, but so far it's moving the direction that I predicted rather than the direction that Kap has predicted. "No thanks. Sam does not understand what he is reading and can't even figure out appreciation from depreciation. For example...the dinar only devalued once (not twice as Sam thinks in the last 5 years) to citizens (market rate) only when the IMF asked to reduce the value for reporting purposes as part of a Stand By Agreement to accelerate reforms/compliance. Had technically nothing to do with the currency weakening as he thinks. lol He is twisting meanings and words to fit his LOP theory for years, yet the two recent articles (one from CBI) and the other from parliament once again confirm the intentions to raise the value to reduce inflation (technically at this time there is less than 2% inflation in Iraq) so they are talking about the inflation that occurs as a result of capital that come with investment (referring to activating the economy) which can only occur via a float which is a tool used by the CBI to counter such pressure. It has to be a float because the pressure from investment is not one time or a single event. The pressure will be ongoing as investment/investors increase. Feel sorry for Sam he is trying to help some with the guru nonsense but going overboard trying to debunk reality. It would be better for him to read about transitions than to spout off his nonsense." Anybody who has been around for a few years in the dinar world remembers when the rate went from 1166:1 to 1184:1 in 2015 and from 1184:1 to 1190:1 in 2018. Kap is only hurting his own credibility by insisting that it only devalued once. I think Kap believes that the dinar went to 1184 as result of IMF instructions. The end result of that move was in essence 1190 because the CBI adds 6 dinar commissions. Now the second move was never really a move, just the addition of the commission in the advertised price. Therefore, no change in value. Still 1190. I don't think Kap really cares anymore anyway. He has proven what will happen and many agree including me. Don't know why you even comment on something that is pointless anyway. 12-17-2013 Newshound Guru Kaperoni I have talked about the CBI conforming to the IMF requirements. Today for the first time since 2010 the CBI is in compliance with the IMF. They officially stated they Official rate of the dinar at 1179 and the Market rate at 1190. That is below the 2% requirement (a little over 1%). This is a requirement that the IMF stated clearly was a condition in the Article IV consultations. If the CBI can maintain this, it will go a long way to transitioning out of Article XIV and to Article VIII. 12-17-2013 Newshound Guru Kaperoni I am expecting in the coming days we may also very well see the CBI start selling the bonds as well for monetary policy in dinars. I am sure the CBI and IMF are both smiling today. When you pair this information with two new articles released today, it appears the CBI may be gearing towards exiting the current exchange regime under Article XIV and move to the new regime (we hope a float) in Article VIII sometime in January. At the end of January the CBI is hold a conference in Dubai! So, we have the CBI meeting the IMF requirements today, we have the article saying mid-january the banks will be "stimulating the economy". And now we have this Dubai banking conference end of Jan.
12-17-2013 Newshound Guru Kaperoni It is very apparent to me that the CBI will try and move to IMF Article VIII within the next 30-60 days. If the CBI moves to Article VIII in January, the value will begin to rise then. It all depends on the exchange regime they chose when they move to Article VIII. If its a free float, it may correct itself very fast. If its a managed float it could take a while. The IMF prefers a free float. Today is a good day. We should all be happy today. 12-22-2015 Newshound Guru Kaperoni from CBI site - "Board Resolution No. (329) for the year 2015 (the exchange rate)" So some are wondering why we saw that 1182 rate and Iraq didn't pick up on it until today...well these CBI docs show us..that the board approved the rate change on 11/30..effective 12/1 (which it changed on the CBI site). but the actual announcement didn't come out until 12/18 (media). They also tell us the CBI bank rate now at 1190 which means the 2% spread is 1214. So the dinar Market Rate has to be 1214 or less than that. And today it is 1220 which is out of compliance. It is frustrating, but the rule is more for the CBI than the IMF. They want the CBI to know how to manage the spread before the playing field becomes international. 1-20-2018 Newshound Guru Kaperoni Article: "Alaq announces the opening of a new branch of the central bank in Najaf " Quote: "The governor of the Central Bank of Iraq Ali Alalak revealed, on Tuesday (December 26, 2017), that the bank reserves of foreign currency of 48 billion dollars, pointing out that Iraq will not resort to floating the currency." Until they get in compliance with the IMF and reduce the spread to 2% or less, I would assume any such discussion is a "stable dinar". Eventually they will have to float to compensate for the pressure created by the influx of investment capital. The governor of the Central Bank of Iraq Ali Alalak, Saturday, close to the opening of a new branch of the Central Bank in the province of Najaf, while the new branch will provide services to the Middle Euphrates . 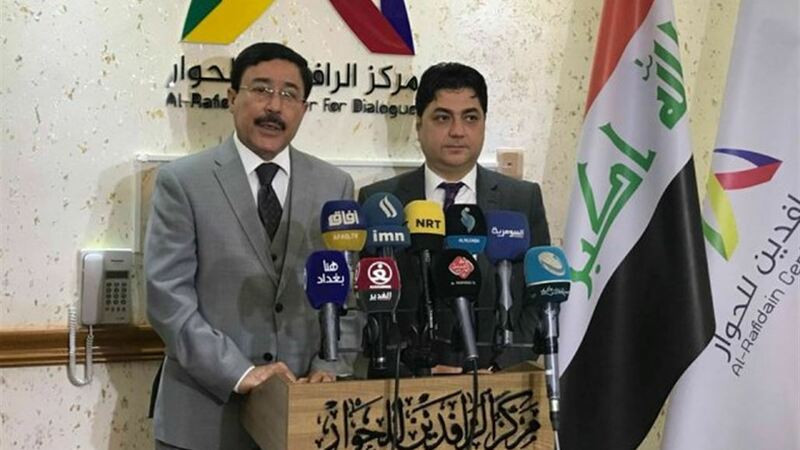 "We will open a new branch of the central bank soon in Najaf to provide services to the Middle Euphrates," Alaq said at a press conference held at the Rafidain Center for Dialogue in Najaf province. "The relationship with the International Monetary Fund is a partnership relationship, and they have no conditions other than the development of the banking sector," adding that "the adequacy of foreign exchange reserves within international standards is 160%, which is a good indicator." The governor of the Central Bank of Iraq Ali Alalak revealed, on Tuesday (December 26, 2017), that the bank reserves of foreign currency of 48 billion dollars, pointing out that Iraq will not resort to floating the currency. "The Commission is determined to make these changes during the next phase and not to follow the traditional methods are not appropriate at the moment."